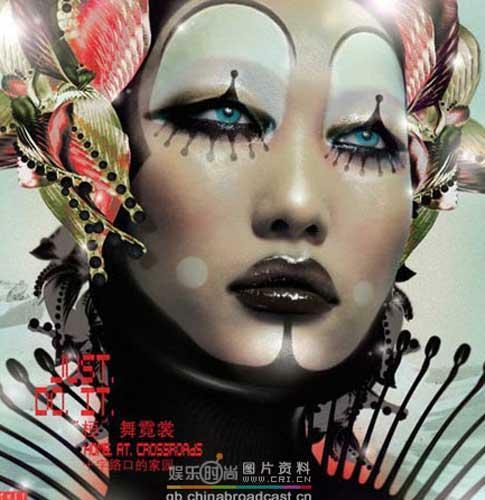 The girl's clown eye makeup is inverted so that her symbolic tears run upwards. Image Source: eyeshadowlipstick. Here are a few images I've come across of late. The 3 November 2013 eclipse as seen during sunrise in Bermuda. Image Source: BerNews. 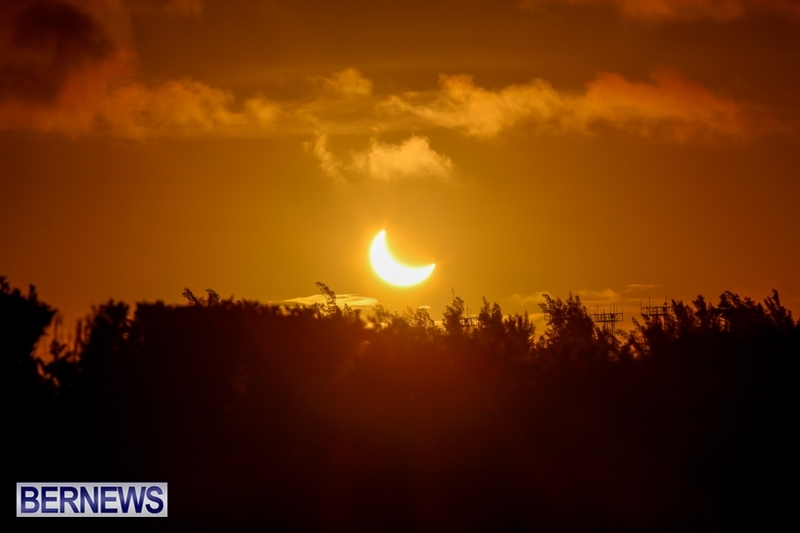 The sun underwent a rare hybrid eclipse on 3 November 2013. A hybrid eclipse shifts between a total and annular eclipse (the latter occurs when the sun and moon are in line, but the moon appears slightly smaller, creating a ring of fire around the black body of the moon). Most of this eclipse was visible from Africa. Time has published pictures of people watching it, some of which are reproduced below. 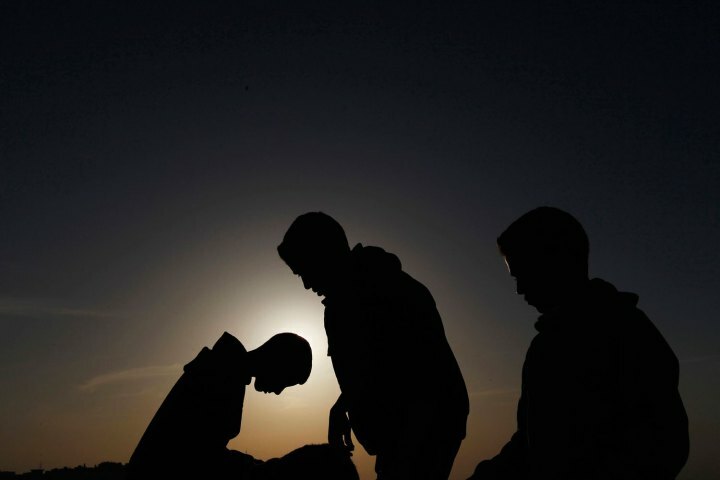 "People observe a solar eclipse in Amman, on Nov. 3, 2013." Image Source: The Weather Network. 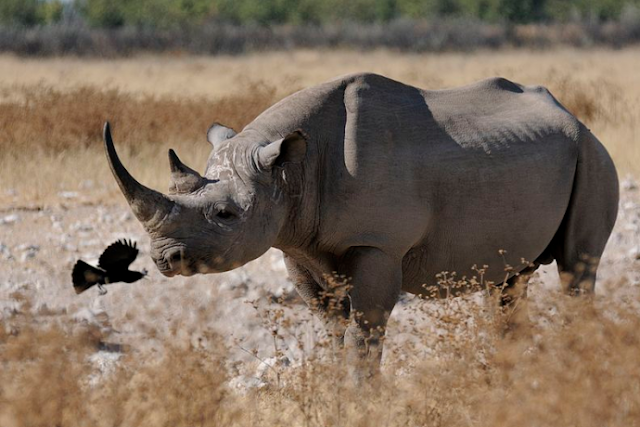 A sub-species of the black rhino that roamed the earth for 8 million years has been declared extinct, according to a 2011 review by the International Union for Conservation of Nature's (IUCN). The animal hasn't been seen in the African wilderness since 2006 due, almost exclusively, to widespread poaching and a lack of conservation efforts. Sadly, the fate of this sub-species is not unique: Rhinoceros populations across Africa and Asia are said to be disappearing at an alarming rate. The animals are hunted for their horns, which are considered an aphrodisiac. This belief has spurred a lucrative black market that is pushing rhinoceros to the brink of extinction. Still from The Hobbit: The Desolation of Smaug. Image Source: Collider. It may surprise some that space colonization is already in the planning stages. Earlier today, India launched its Mars orbiter, Mangalyaan ('Mars craft'), due to arrive at the Red Planet next year, as part of the new Asian space race. See coverage at Spaceports here.There is great interest in the vast resources of space (see my earlier posts here and here), especially Saturn's moon Titan (see bitcoin chatter here). Long before we possess the ability to reach and inhabit interplanetary destinations, the spacefaring countries of the world are mapping and naming them (the relevant UN document regarding space exploration and colonization, the Moon Treaty, is here). 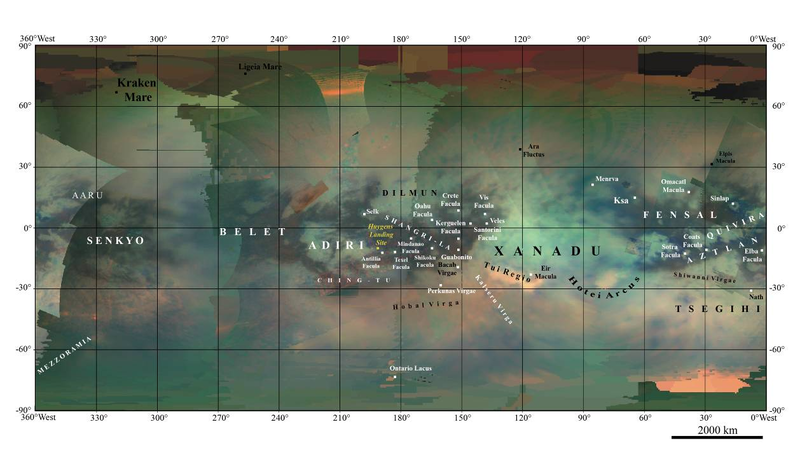 See comments on interplanetary territorial claims here and here. Map of Titan (click to enlarge). Image Source: Europlanet. According to Wiki, the "International Astronomical Union names all colles (small hills) on ... Titan after characters in J.R.R. Tolkien's work. In 2012, they named a hilly area 'Bilbo Colles' after Bilbo Baggins." You can see the Astronomical Union record for the hill here and current maps of the moon, here, here and here. Rarely have the frontiers of the old legends, modern imagination, and the future so clearly overlapped. 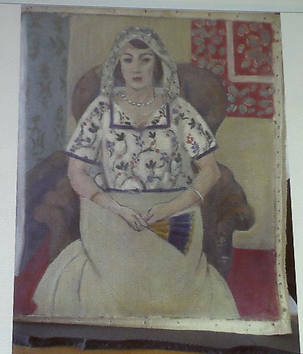 A previously unknown work by Henri Matisse (1869-1954). It dates from the mid-1920s and is in the Munich horde. Image Source: Focus. 90 per cent of the works of art looted and plundered by the Nazi are still unaccounted for. There are reports today that a 1 billion euro horde of paintings, stolen from Jewish owners during World War II, has been uncovered in a raided flat in Munich. The story was broken by Germany's Focus magazine (see their reports here and here). Some of the works are so-called 'degenerate' 20th century pieces, reviled by the Nazis. Many others were done by European masters, from Durer, to Matisse, to Chagall, and some of these have never been seen before. In other words, this find changes art history. The art world is buzzing with this news and keen to see the full collection. However, the authorities are not posting the full collection online, and are telling descendants of original Jewish owners to contact the police and identify the artworks and place claims. You can see a small selection of the paintings here. Art historians specializing in returning looted Nazi artwork to their rightful owners have demanded that the German authorities reveal the details of a hugely valuable collection of paintings, discovered in a Munich flat. The remarkable horde of paintings, valued at an estimated euros 1 billion, was found hidden behind piles of junk in the flat of reclusive 80-year-old Cornelius Gurlitt. It was discovered by chance in spring 2011 when prosecutors began investigating Mr Gurlitt for tax avoidance, but its existence was made public only at the weekend. Anne Webber, the founder and co-chair of the Commission for Looted Art in Europe, said there were some “very hard questions” for the Bavarian government as to why it had kept the haul secret for two and a half years. “We need to ask why they haven’t published a list of all the paintings that have been found, so that the families who are looking for their paintings, and have been looking for the past 75 years, can find them,” she added. The collection has been stored at the customs office in Garching, north of Munich, with an art historian hired 18 months ago to provide an expert assessment. 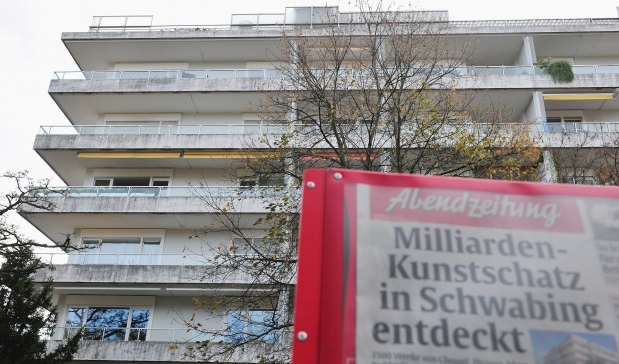 Mr Gurlitt could have hidden other works elsewhere, Der Spiegel suggested. Prosecutors will hold a press conference Tuesday to provide more detail. Gurlitt’s father Hildebrandt was a prominent Munich art dealer, who is thought to have acquired works deemed “degenerate” that had largely been seized from Jewish collectors. See reports here, here, here and here. Since 2011, possibly no group of characters in the DCnU has suffered more than the classic Teen Titans. 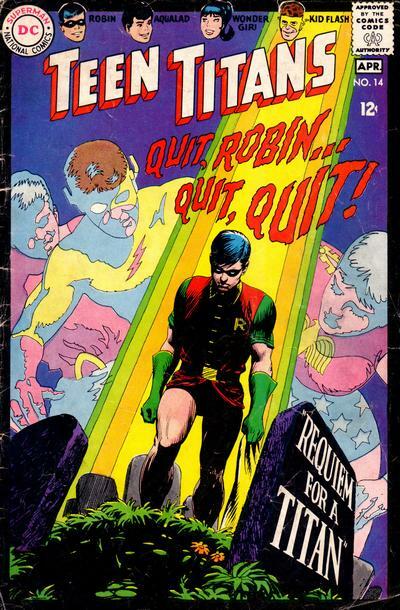 Sadly, the creator who helped make that series so memorable, Nick Cardy, passed away yesterday at the age of 93. A war veteran, Cardy returned to America and became one of the most important comics artists of the Silver Age. You can see a selection of his best covers here and here, and tributes here, here and here. Cardy during his days as a soldier. Image Source: CBR. On the Unofficial DC Discussion Boards, we discussed Cardy when he gave one of his last interviews to the Sarasota Herald-Tribune in May 2013. Cardy was a veteran of World War II. He fought as part of the US Army's 3rd Armored Division, 'Spearhead,' and as one fan put it: "Holy Cow! He was in some very scary places!" 66th Infantry Division black panther insignia, designed by Nick Cardy. Image Source: eBay. 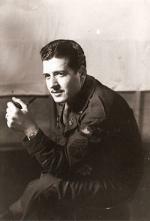 Cardy did World War II military service from 1943 to 1945, earning two Purple Hearts for wounds suffered as a tank driver in the armored cavalry. He began his Army career with the 66th Infantry Division, during which time he won a competition to design its patch, creating its snarling black panther logo. His art talent led to his being assigned an office job at division headquarters. This lasted, Cardy recalled in an interview, because a general who had seen Cardy's cartoons in an Officers Club had Cardy assigned to his own corps. (Cardy gave the name as "General Shelby Burke", but no one by that name or similar is found in the federal archives.) As the artist tells it, the only opening was for a corporal in the motor pool, so Private Cardy was promoted and assigned to that duty. This, he said, led in turn, upon his being shipped to the European theater, to Cardy's assignment as an assistant tank driver for the Third Armored Division, under General Courtney Hodges. Later, between the end of the war and his discharge, Cardy said he worked for the Army's Information and Education office in France. Cardy's subsequent work as a comics artist reflected the way American popular culture helps US society digest its most difficult trials. Awarded two Purple Hearts for his combat injuries in the war, Cardy experienced his share of wartime horrors; he saw his tank commander get his head blown off when they were ambushed by German troops with bazookas. Drawing those commonplace moments in a war was necessary to his sanity. Incidents such as his tank commander being killed, or seeing cartloads of dead bodies, or opening a trap door to see dozens of scared faces looking up at him, are "something that you'd rather not know," said Cardy. "I tried to focus on the lighter stuff. "I had a policy after I got out of the Army. I was so tickled to get out of the Army alive, I was not gonna let anything bother me." This is why above all other characters, under his pen, the Titans became beacons of youthful hope, shining out of the darkness. 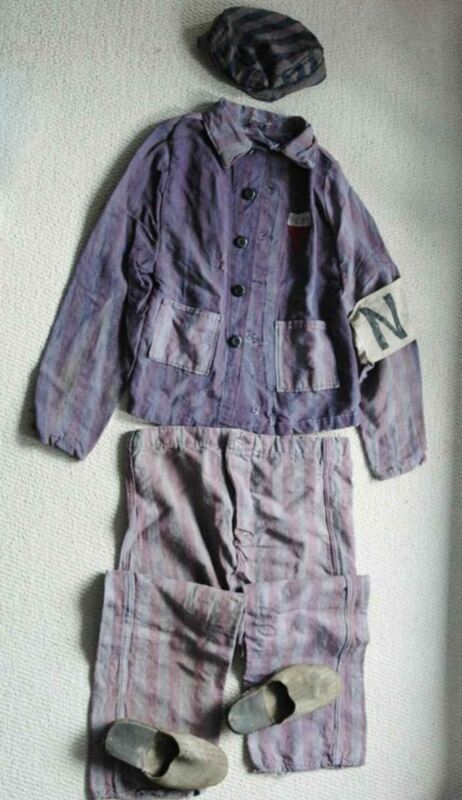 Concentration camp uniforms were just pulled off eBay. Image Source: Daily Mail. Currently, there is an article on Yahoo about concentration camp memorabilia that was posted on eBay (see also reports here, here and here). This story about enslavement reminded me how the Web has a buried symmetry (see my posts on this here and here), because it led me into tabloid territory, to this story about Steve Jobs. Not only does the Web have a buried symmetry, but a vast potential for false associations. Any given news story or marketing campaign will be subliminally interpreted in terms of the other stories which are randomly juxtaposed with it on the same day. The old context in which we used to grasp information - say, regularly at 6 and 11 o'clock p.m. - has disappeared. It has been replaced by the new context of the 24-hour Web landscape of a particular day, which includes new articles from that day and any older material that Web users will unconsciously float to - before, during and after - looking at the given story in question. But is browsing unconscious? Just by chance, juxtaposed with the nasty and distasteful eBay concentration camp memorabilia story was a piece on Steve Jobs' ex-girlfriend, Chrisann Brennan. Brennan has just published a rambling tell-all about the early years behind the scenes at Apple. Brennan's memoir is a portrait of how the boy she knew in high school, obsessed with computing, became a corporate mogul, all filtered through her understanding of reality. She mentions Jobs' guru, Kobun Otogawa, and a lot of personal details (see an excerpt here). This dirty laundry led me to two videos which address Apple's Chinese production problems. Oddly, these videos were suggested to me. I wondered how quickly Google tailors your viewing experience on Youtube, depending on your browsing history and which news stories you've just read. Isn't the tailored browsing experience instantaneous? In which case, did Google bring me to the Youtube video about Apple's Chinese outsourcing because I had just looked at a news item about eBay concentration camp memorabilia sales?